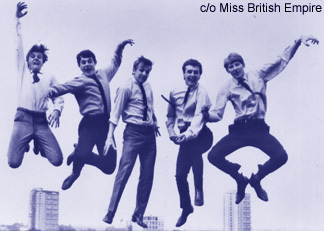 The Rockin' Berries were the second Brumbeat group to have a hit record although they had been around for quite a few years prior to that and the line-up had undergone many changes. Their vocalist Geoff Turton went on to have a successful solo recording career. The Rockin' Berries are still performing today as one of the few surviving bands from that era. 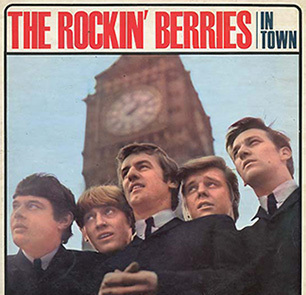 The origins of the Rockin' Berries can be traced back to the 1950's when Brian "Chuck" Botfield (born 14 November 1943, Birmingham), and Geoff Turton (born 11 March 1944, Birmingham), met as students while attending Turves Green Secondary Boys School where they both played clarinet in the school band. Chuck Botfield went on to Moseley College of Art in 1955 where he formed a skiffle group with fellow Turves Green school-mate Tim Munns who played bass along with guitarist Bob Bates, drummer Barry Taylor, and a girl from Bearwood named Christine Perfect who played piano. 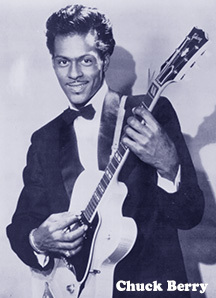 The group was originally called "The Bobcats" but later changed to "The Rockin' Berries" as they played a lot of Chuck Berry songs - not surprising as Chuck Botfield was a big fan and adopted his hero's name. The Rockin' Berries first booking was at the Cofton Community Centre in Longbridge. Note: Christine Perfect would become a well-known blues singer during the later 1960's as vocalist for the Stourbridge based group Chicken Shack. She eventually found international stardom as a pivotal member of the world-famous 'Fleetwood Mac' under her married name Christine McVie. An aspiring rock 'n' roll singer named Paul Hewitt and guitarist Doug Thompson who both worked at the Austin Motors in Longbridge, were forming their own band in 1959. They enlisted Mark Johnson to play bass guitar along with Doug's brother-in-law Terry Bond who played the drums. Terry Bond (born 22 March 1943, Birmingham) lived in Sir Hilton's Road, West Heath and worked as a hospital clerk. In search of a good lead guitarist, they heard the Rockin' Berries were disbanding so invited Chuck Botfield to join them. Botfield agreed providing that the new group would also call themselves The Rockin' Berries. Doug Thompson made a deal with the owners of the disused Palace Theatre in Redditch for the Rockin' Berries to play there and keep the door takings in return for cleaning the place up. This arrangement proved so successful that The Rockin' Berries started performing there regularly along with many other local groups. The Berries also made their first recording at Hollick & Taylor in Handsworth featuring Paul Hewitt singing 'Someday' by Ricky Nelson. Meanwhile, the original Bobcats/Rockin' Berries bass guitarist Tim Munns had joined up with another former school friend Geoff Turton (who went to school with Chuck Botfield) and singer Bob Lawton in a line-up known as "The Swinging Chimes". They gained some success locally - even winning a Birmingham Parks Band Competition. Tim Munns re-joined the Rockin' Berries at the request of Chuck Botfield when Mark Johnson left the band to pursue a non-music career. By this time, the Rockin' Berries were very well-known locally. They were now fronted by two vocalists; Paul Hewitt (with the stage-name of Bobby Thompson) and Jimmy Powell - easily one of the most powerful singers in the West Midlands. Jimmy said; "I met the Berries in West Heath. I was the original singer with them." The complete line-up of the Rockin' Berries at this time was Chuck Botfield (lead guitar), Doug Thompson (rhythm guitar), Tim Munns (bass), Terry Bond (drums), Dennis Ryland (tenor saxophone), Paul Hewitt and Jimmy Powell (vocals). 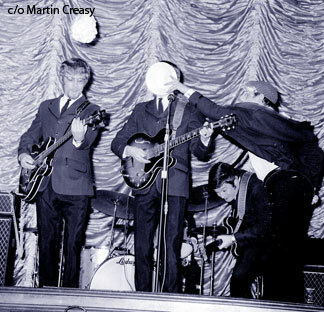 In November 1961, The Rockin' Berries were offered a three month booking in Hamburg - the same place where a then-unknown Liverpool band called "The Beatles" were entertaining rowdy German audiences. Before departing, the Berries gave up their day-jobs to turn fully professional but Paul Hewitt did not want to go so local singer Clive Lea (born 16 February 1942, Birmingham), joined the group as his replacement. Clive Lea lived in Longbridge and had won the "Elvis of the Midlands" contest while backed by his own group The Phantoms. Lea was known around Birmingham at the time as a singer and impressionist. 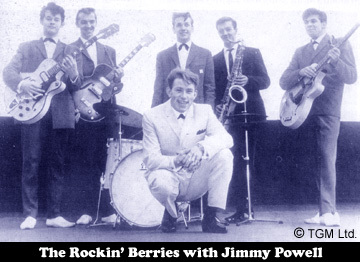 "Brian Epstein had an interest in me as a solo artist but I turned him down saying we'll stick together as a band"
Upon returning from Germany, the Rockin' Berries were auditioned by TV pop music promoter Jack Good who was scouting for the Decca Record Company. Jimmy Powell said; "Jack Good was auditioning for a new television show. We went down to Aston, Birmingham - the old ITV studios. He was more interested in solo artists back then as you know - Billy Fury and people like that. We had also played support for The Beatles in Liverpool where Brian Epstein had an interest in me as a solo artist but I turned him down saying we'll stick together as a band." The "band" failed to secure a contract but Jack Good showed interest in signing singer Jimmy Powell. As the Rockin' Berries were booked for a return engagement in Germany, they went back but when offered an extension to stay longer, the group were divided over the prospect of remaining. Jimmy had plans to form his own group so he returned to Birmingham, taking Doug Thompson, Dennis Ryland, and Tim Munns with him, leaving the others to carry on in Germany. 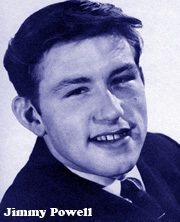 Jimmy Powell would take up Jack Good's offer of a recording contract and become the first "Brumbeat" recording star in 1962 (see Jimmy Powell). Doug Thompson embarked on a new career to become well known around Birmingham as an entertainment promoter and booking agent. Tim Munns moved to London where he worked for Kinks manager Larry Page and later re-joined Jimmy Powell in his band "The 5 Dimensions". The seriously depleted Rockin' Berries line-up urgently needed replacement bass and guitar to complete their German engagement. 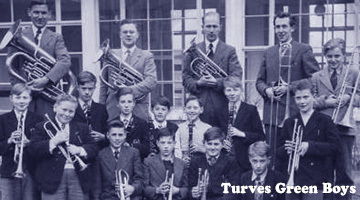 Chuck Botfield remembered his old school-friend Geoff Turton who had played guitar for a group back in Birmingham called The Swinging Chimes. Geoff said; "I got the call from Chuck right out of the blue so I literally downed tools - I was working in a factory as a toolmaker - and flew out to Germany to join them. Just two of us, me and Roy Austin." Bass guitarist Roy Austin was born 27 December 1943 in Birmingham and lived in West Heath. He was previously in a local group called The Eko's whose remaining members went on to form The Cheetahs and The Plazents (who became The Brumbeats). When Roy joined The Rockin' Berries in Germany along with Geoff Turton, their line-up puzzle was complete. After arrival in Germany, it was soon discovered that Geoff Turton posessed a unique 'falsetto' vocal that was used by the Rockin' Berries to their advantage when performing songs by high-harmony groups like "The Four Seasons". Geoff recalled; "I'd never really sung before, just played the guitar. We were doing these long six-hour sets in Germany and needed more than one singer. Clive was doing all the lead vocals at that time, I was doing back-ups and so I tried a few things out. We suddenly found that I could sing in this falsetto. The first thing I did on stage was Frank Ifield's hit 'I Remember You'." When the Rockin' Berries returned to Birmingham, they quickly gained attention for their tight and well-rehearsed stage presentation - due no doubt to their long hours of performing while over in Germany. By this time, The Beatles were taking the country by storm thus prompting the big London record companies to go north in search of other talented "beat groups". "We did two 45-minute sets and blew everyone away. We were flooded with offers!" Geoff Turton remembered; "We decided to put on our own showcase in Birmingham and invite all the local agents along to see us. We did two 45-minute sets and blew everyone away. We were flooded with offers!" The group were contacted by Decca Records who had been sent a demonstration tape of their songs. This resulted in the Rockin' Berries going down to London and signing a recording contract. 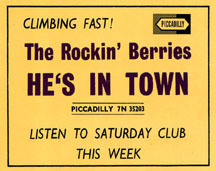 The Rockin' Berries were soon booked into the Decca Studios to record their first single. Issued in July 1963, the A-side was titled 'Wah Wah Wah Woo' along with 'Rockin' Berry Stomp' for the B-side with both songs composed as a group effort. Their second single A-side covered James Ray's US hit 'Itty Bitty Pieces' that led to them performing the song on the influential TV pop music show 'Ready Steady Go!' but neither single sold enough to qualify as a hit. Despite a lack of chart success, the publicity generated from the records served to increase the group's following. The Rockin' Berries worked on refining their stage shows by introducing comedy - something they initially tried over in Germany to help relieve long hours of boredom. They weren't the first band to do this as other British groups who performed there including The Beatles had also used some comedy in their sets. Clive Lea's funny impersonations of famous personalities such as George Formby and Norman Wisdom were well received - especially when performing to an older audience. After a year, the Rockin' Berries were dropped by Decca. Maurice King who managed 'The Walker Brothers' at the time, told talent scout John Schroeder about the group. John previously had much success producing records for teen singing sensation Helen Shapiro while working for Norrie Paramor at Columbia Records. John went to see the Berries perform at the 'Cadburys Club' in Bournville, Birmingham. He became the Rockin' Berries recording manager and producer after signing them to the Pye Records subsidiary label 'Piccadilly'. 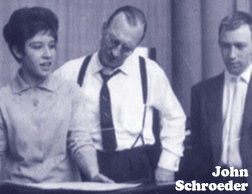 John Schroeder recalled; "I was immediately impressed by The Rockin' Berries. They'd achieved a reasonable fan following and were working regularly - far more in fact than the average local beat group. This was perhaps because of their versatility. They possessed a strong comedy side to their stage set provided mainly by Clive Lea whose impersonations always went down well. But the real commercial strength came from Geoff Turton's truly exciting vocals. It was an extremely powerful and commercial sound - but material wise, it was very hard to know what to do with it". Now managed by Maurice King, the first record release for The Rockin' Berries on the Piccadilly Records label was a cover of The Shirelles' 'I Didn't Mean To Hurt You', which scraped into the UK Top Fifty. Issued in September 1964, it featured Geoff Turton's distinctive falsetto vocal - soon to become a band trademark. This record might have done better if not for a fateful event as described by drummer Terry Bond. Terry said; "It all happened when P.J. Proby invited us to a party at his flat. A friend of his, Kim Fowley said he'd found just the song to suit our style. He played us a disc of 'He's In Town' by American group The Tokens. He was convinced it would give us our first big hit." "We loved it and wanted to record the song as soon as possible, so we immediately took it to our recording manager John Schroeder. John was just as excited as we were and fixed a special recording session for the next afternoon." American record producer Kim Fowley went on to play an influential role in the careers of a number of Midlands groups (see BrumBeat Kim Fowley CD review). John Schroeder gave a different account of what happened. "I went to Birmingham to see the group and they had made an excellent demo of 'I Didn't Mean To Hurt You'. Because I couldn't find anything stronger at the time I decided to release it. Shortly after this, the publisher of the American release of 'He's In Town' recorded by The Tokens brought the song to my attention. I decided it would be great for the Berries but it would have to be recorded really quickly before The Tokens record had the chance of being released. The Berries had one week to work it out and after we had recorded it no one could believe how good it was." "We knew all about the screamers of course... We just couldn't hear ourselves playing or singing!" 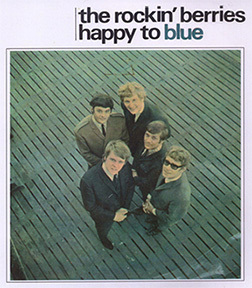 Whatever the case, it turned out that The Tokens' version of He's In Town (composed by legendary songwriters Gerry Goffin and Carole King) was due to be issued in the UK, so Piccadilly stopped promoting I Didn't Mean To Hurt You and rush-released The Rockin' Berries recording of He's In Town into the shops along with airplay on pirate radio. The record went to Number 3 in the British charts, thus confirming its commercial viability. At the time of their hit single, The Rockin' Berries were touring the UK supporting 'Bill Haley & The Comets' and 'Manfred Mann'. Geoff Turton said; "We really couldn't believe it when it first happened to us. It was the last thing we expected. We knew all about the screamers of course because of all the hit groups and singers we'd been supporting and touring with. We just couldn't hear ourselves playing or singing!" The group had little time to enjoy their new-found pop star status as they now had to follow up the success of He's In Town with another hit record. An excellent composition titled 'Funny How Love Can Be' by Birmingham songwriters John Carter and Ken Lewis was recorded by The Rockin' Berries for their proposed next single. Unfortunately for them, Carter and Lewis (then performing as part of a harmony trio called "The Ivy League") justifiably wanted their version released first. Funny How Love Can Be became the first Top Ten hit for The Ivy League with the Berries version appearing only as a track on their first LP issued in time for Christmas 1964. 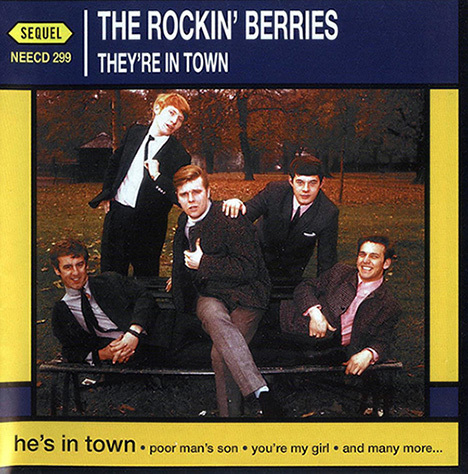 The Rockin' Berries album aptly titled "The Rockin' Berries In Town" was issued to good reviews and sold well. It included a diverse selection of songs, some with orchestral backing, composed by different writers including John Schroeder but no original songs by the band members. One track titled 'Shades Of Blue' was a cover of a song by Piccadilly label-mates The Hellions and composed by future Traffic members Jim Capaldi and Dave Mason. John Schroeder said; "America was producing some great artists and songs so from a producer's and record company's point of view, the fashionable thing was cover the American 'hit' and release it before the original record could be released. Of course it wasn't long before the Americans got wise as to what was happening and prevented the situation by releasing the original record before it could be covered." The next Rockin' Berries single issued in January 1965 was another American cover titled 'What In The World's Come Over You' and although catchy, it was less successful and reached Number 23 in the record chart. 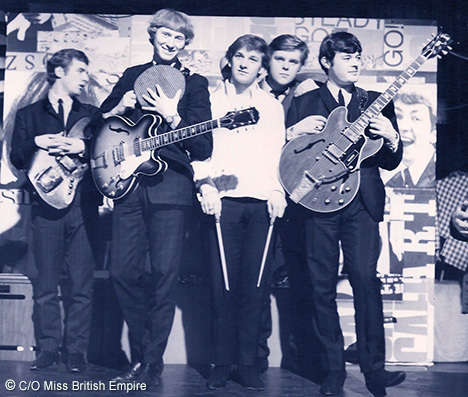 Even so, the Berries performed their first two hits on the British film "Pop Gear" hosted by Jimmy Savile and which also featured The Beatles and fellow Brum band The Spencer Davis Group along with many other up-and-coming pop groups of that time. 1965 was to be a very hectic year for The Rockin' Berries as they worked up and down the country to capitalize on their chart success. John Schroeder found a song by American group 'The Reflections' that he was convinced would be a hit for the Rockin' Berries. Geoff Turton recalled; "We played a gig in Newcastle and then spent all night driving down to London for a recording session at something like 10 o'clock in the morning. There was only one motorway in England in those days and it was all dodgy trunk roads and 'A' roads. Then after the three hour session, it was all piled back in the van and driving like lunatics to get to the next gig which was back up in the north east!" "We think it's the best thing we've ever done, much more mature than our previous records"
Their effort was worth it as the single A-side they recorded titled 'Poor Man's Son' was indeed hit material. Chuck Botfield said; "I tuned my guitar down from E to D to give it more body and make a heavier sound. I even recorded two guitar tracks on it." Clive Lea who sung the main vocal on the recording said; "We think it's the best thing we've ever done, much more mature than our previous records." Issued in May 1965, Poor Man's Son climbed the charts all the way to the Number 5 position. 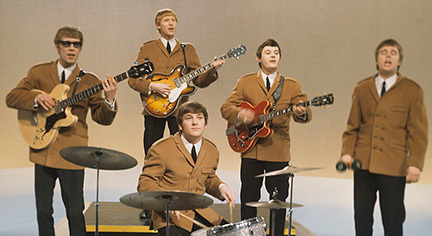 Now at the height of their hit-parade success, The Rockin' Berries performed live on ATV's popular variety show "Sunday Night at The London Palladium" in May of 1965. The next day, bass guitarist Roy Austin left the group for reasons unknown. He was quickly replaced by Liverpool bassist Bobby Thompson from 'Cliff Bennett and The Rebel Rousers' whom the Berries had recently met on a tour with Roy Orbison. Bobby had also briefly played in "Rory Storm and The Hurricanes", a group that had included Beatles drummer Ringo Starr. By coincidence, Thompson had the same name as used on stage by one-time Rockin' Berries singer Paul Hewitt. Bobby's first appearance with the Berries was on Top of The Pops where they 'mimed' Poor Man's Son. After three months following the success of Poor Man's Son, Piccadilly released The Rockin' Berries next single. 'You're My Girl' was another Goffin & King cover and was certainly worthy of success but only reached a chart position of Number 40. An extended player 'EP' of four new recordings by the Berries was also issued at around the same time. While the group continued to make appearances on radio and TV, they began to rely more on comedy routines for their increasingly lucrative engagements on-stage. The Rockin' Berries were certainly at a disadvantage from not having internal songwriters but they put a lot of effort into refining their stage show. While other hit groups worked towards joining the famous "British Invasion" and touring the USA, the Rockin' Berries concentrated on cabaret. Their drummer Terry Bond was interviewed by the Record Mirror magazine for whom he described (somewhat prophetically) their situation at the time. "The stage show has got dead polished now which we're hoping will stand us in stead for the next few years. We want to be an act which can last for a long time - getting regular steady bookings for regular steady money." A summer season at Great Yarmouth saw The Rockin' Berries on the same bill as the very successful harmony-trio "The Batchelors" who appealed to a much older audience. Nonetheless, their influence on the Berries seemed to be considerable. Terry Bond said; "We never used to dig their presentation, but after working with them we've changed our minds. The way those boys slay the audience is just terrific - they go over so big!" While tailoring their sets to accomodate the age-group of the audience, a shortage of potential hits for the Rockin' Berries to record was a continuing problem. Their latest single titled 'The Water Is Over My Head' by Al Kooper was a good record but only reached Number 43 by early 1966 and was to become their last entry in the record charts. By this time, the pop music scene had changed and the "beat group" era was ending. The Rockin' Berries were now one of the UK's top cabaret acts who were heavily in demand for bookings all over the country. Years later, Terry Bond said; "I think all that comedy held us back recording-wise and sometimes I feel that things could have been handled a lot better. The trouble was that though we had great harmony vocals, it was our comedy aspect that people always picked up on, so we began doing summer shows and such-like far too early." Geoff Turton recalled; "We never really had much control over what was released, or even what was recorded. We were too busy out on the road every night to think about our recording career as much as we should have. Mind you, there was one song I'll always remember. We begged Pye to let us record The Left Banke's 'Walk Away Renee' but they told us it would never be a hit here." Bobby Thompson said the Berries did record the song but if so, it was never issued. When recorded by The Four Tops, Walk Away Renee got to Number 3 in the UK at the end of 1967. The Berries recorded a wonderful rendition of 'Barterer's And Their Wives' also by The Left Banke but the track remained unreleased. Geoff Turton and Bobby Thompson wrote a few Rockin' Berries B-sides but their efforts likely weren't encouraged as much as they deserved. In any case, harmony groups were becoming out-dated by the mid 1960s although ironically, the wonderful vocal arrangements on Rockin' Berries records such as the Charlie Chaplin classic 'Smile' showed the group's greatest strength. Before the end of 1966 Geoff Turton left The Rockin' Berries due to "family commitments". Geoff's place was filled by vocalist Rod Clark who came from no less a group than the internationally successful Moody Bues. Rod had originally sought fame with "Carter-Lewis and The Southerners" - the Birmingham-born songwriting team whose guitarist was future Led Zeppelin star Jimmy Page. Rod was later recruited by Brum's famous Moody Blues in summer 1966 to replace their departing bass guitarist Clint Warwick. Unfortunately for Rod, his time in the Moody Blues was short as the band fell apart when Denny Laine left to go solo. Rod Clark had little time to adjust to the Rockin' Berries heavy schedule of concert bookings. One of his first performances with the band was the popular 'Sunday Night at The London Palladium' in support of Roy Orbison. The show was televised live to the nation but with a professional attitude, Rod took it in his stride and few of the audience noticed Geoff Turton's absence. However, a few months later Rod was gone and Geoff was back in the line-up again. 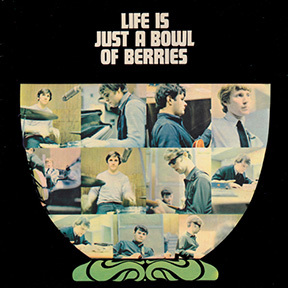 The Rockin' Berries second album "Life is Just a Bowl of Berries" had sold poorly as did their latest singles purchased by a dwindling number of young fans. The group was no longer considered fashionable although it didn't seem to matter as they had no shortage of well-paid bookings in cabaret and Christmas pantomimes. One of the more notable engagements for the group took place when they were invited to and performed at 1967's coveted 'Royal Variety Performance' attended by The Queen and Prince Phillip. At the height of the 1960s psychedelic era, a song titled 'Yellow Rainbow' was recorded by The Rockin' Berries and was apparently composed by Roy Wood of The Move who may have also contributed backing vocals. It wasn't the same song recorded by The Move as a track on their first album. Unfortunately, the Rockin' Berries Yellow Rainbow was never released although it was certainly commercial enough to have made the charts at the time and may have restored some of the group's credibility to record buyers. 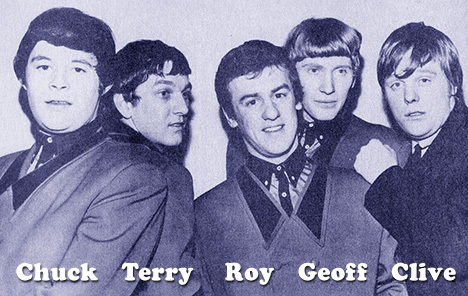 "I was convinced we were still capable of having pop hits if we could find the right material"
In 1968, their charismatic singer Geoff Turton left The Rockin' Berries again - this time 'for good'. He said; "I was having personal troubles with the group but when I left, I found it was all me. I was convinced we were still capable of having pop hits if we could find the right material. To be honest I took it really badly, and for a while I was quite difficult to work with which is why I left"
Geoff Turton briefly joined the Birmingham group Sight And Sound but with encouragement from John Schroeder who signed him as a solo artist, soon embarked on a fairly successful recording career. He initially had a single released under his own name before re-inventing himself when John gave him the stage-name "Jefferson" and arranged studio time with top session musicians and an orchestra. Geoff's hit single titled 'Colour Of My Love' almost made the Top Twenty in 1969 and went on to chart in America along with a bigger hit written for him titled 'Baby Take Me In Your Arms'. 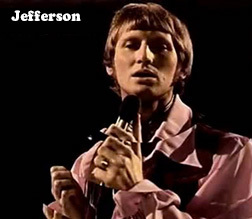 The self-titled "Jefferson" album produced by John Schroeder was also a big seller (see Jefferson). Yorkshire singer/impressionist Terry Webster joined the Rockin' Berries in 1970 to replace Clive Lea who left to start a solo career as an impressionist. Clive later joined local comedy group "The Black Abbotts" as replacement for popular comedian Russ Abbott. He eventually retired after a long career in comedy, but remembers his days as one of The Rockin' Berries with justifiable pride. The remainder of the Rockin' Berries continued to perform in cabaret as an in-demand music/comedy act whose engagements have taken them all over the UK as well as bookings abroad. The band continued to record occasionally with their efforts issued on various small record labels. Terry Bond later moved into management and was replaced by famous drummer Keith Smart, previously from legendary Brum band The Uglys and Roy Wood's chart-topping group "Wizzard" (see The Move). Keith eventually went on to manage The Rockin' Berries himself. Despite numerous other personnel changes in the following decades which include appearances with Geoff Turton (he's left and re-joined about 75 times according to his own estimate! 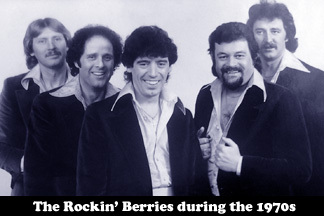 ), the Rockin' Berries led by remaining original member Chuck Botfield, continue to be a popular attraction on the cabaret and nostalgia circuit to this day. 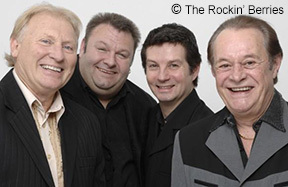 As of 2012, the group included former Move and Wizzard bassist/vocalist Rick Price along with drummer Simon Ryland (son of original Rockin' Berries member Dennis Ryland) and comedy entertainer Jay McGee in support of The Rockin' Berries 50th anniversary tour of the U.K.
As for the Berries old recording manager John Schroeder who produced all their records for Pye so many years ago; "I saw Geoff Turton just before Christmas when he was appearing in the Jasper Carrott show in Woking. It was great seeing him after so many years. He hadn't changed much at all. We had a good laugh about the old times of course." To be fair, The Rockin' Berries weren't the only 1960's Brum band to pursue an all-ages variety and cabaret career following a good run at the record charts. The Applejacks and The Fortunes both followed this route although the latter group did enjoy a respectable "chart comeback" during the following decade. Even the incorrigible Move experienced a disastrous stint in cabaret before the arrival into the group of Jeff Lynne. The Rockin' Berries were to outlast them all. To see an exclusive BrumBeat review of the terrific Rockin' Berries remastered double-CD anthology titled They're In Town, click HERE. Sources: 'The Guinness Book of British Hit Singles' 5th edition 1985; 'The Rockin' Berries - They're In Town' CD anthology book by Roger Dopson 1998; 'Brum Rocked!' and 'Brum Rocked On!' books by Laurie Hornsby 2003; 'The Best of The Rockin' Berries' CD book 1994; 'Where Did You Go My Lovely?' book by Fred Dellar 1983. Special thanks also to John Schroeder, Clive Lea, Tim Munns, Jimmy Powell, and Graham Ashford for assistance in writing this story of The Rockin' Berries.